Super Smash Bros Ultimate brings the long-running fighting game franchise to Nintendo Switch. It isn’t pulling any punches, offering up the largest roster of characters we’ve seen yet. Every single character from Smash history is coming back this time around, and there are new characters as well. One such new character is King K. Rool, and he looks to be a great fit. In this Super Smash Bros Ultimate King K. Rool Guide, we’ll detail everything we know about the character. This includes the alternate Costumes, and the Final Smash. We’ll also take a look at what we know about the King K. Rool amiibo. We’re gradually adding more and more character guides in the lead up to launch day. You can find all of the ones we’ve put together so far in our Super Smash Bros Ultimate Characters Guide. King K. Rool debuts in Super Smash Bros Ultimate. He looks to be a pretty heavy character, though early reports seem promising in terms of his viability in-game. We’ve collected everything you need to know below. You'll want to play King K. Rool defensively. Down B will defelct moves and deal knockback, practise with the timing of this. Dash attack is really eefective for catching characters off guard. The Blunderbuss can be used to drop down platforms. Down Smash is a very good way to spike opponents. Crown throw travels through shields. Down Grab will ground opponents, chain into down smash for high kill potential. This massive villain uses pure force to down opponents in Super Smash Bros. Ultimate. In the table below, you’ll find a complete list of moves that can be used by King K. Rool in the game. It looks like every single fighter in Smash Ultimate will be getting an amiibo. This includes King K. Rool, though we haven’t seen what it looks like just yet. We do have a Tweet confirming it though, which you can view below. Super #SmashBros Collection #amiibo of the five newly announced Super Smash Bros. Ultimate fighters – Simon Belmont, Richter Belmont, King K. Rool, Chrom and Dark Samus – will be released in the future! King K. Rool comes packed with one hell of a Final Smash. It’s called Blast-O-Matic, and sees him firing a giant laser from his secret lair. You can check it out in the video embedded above. 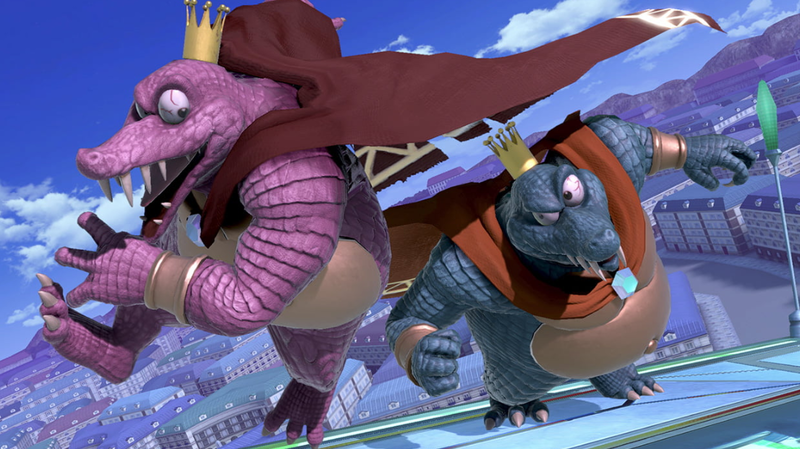 That’s everything we know about King K. Rool in Super Smash Bros. Ultimate. We’ll be updating this guide and other character guides as we get more info, so be sure to check back in regularly. For more on the game, head over to our Super Smash Bros Ultimate Guides hub. It’s got stages, trailers, details on amiibo, and more.